If there were no steelhead in the Dean, the river would be known purely as a world-famous chinook fishery. Dean chinook share the same traits at their steelhead cousins. Due to the need to ascend the Dean River canyon prior to spawning, our chinook are strong, powerful and resilient. From an angling standpoint, there are just a couple of ways in which our chinook are different from our steelhead – they’re bigger, and they’re more powerful. Never will you see your backing more quickly than in the seconds after having hooked a Dean chinook. It’s not uncommon to collect yourself after that first incredible run only to look downriver, see some commotion two runs down, and realize that’s your fish. In the battle of angler versus fish, the Dean River chinook angler is simply over-matched. These fish get hooked with regularity and get landed too, but only after a skilled fight and probably some good fortune. If you’re looking for the ultimate fresh-water angling challenge, this is your fishery. Most guests at BC West fish most of the time with two-handed rods. For king salmon, most rods are 9-or 10-weight, from 12 to 15 feet. Single-handed rods require a bit more effort but work just fine as well! 10- to 12-weight rods have produced many fish over the years. 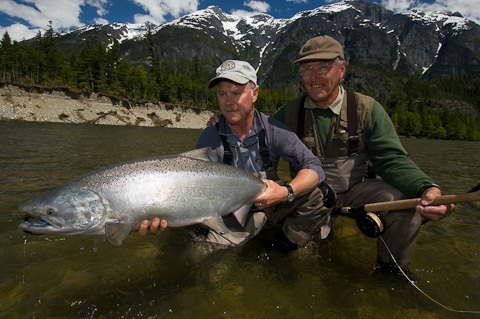 Since we fish tips and relatively large flies most of the time for kings, Skagit-style line systems are our recommendation and the choice of the vast majority of our guests. For king salmon, heavy tips are most effective given relatively high, fast water. 15 feet of T-14 is the ‘go-to’ tip, with lengths ranging from 10 to 20 feet. A short straight length of 15 to 20 pound monofilament is the standard leader configuration at BC West. Flies for king salmon include large profile articulated and strung flies in a variety of color combinations. Marabou, rabbit fur and hair can all create the large, lifelike silhouette that Dean kings prefer. Hooks range from size 2 to 1/0, and octopus-style hooks are particularly effective.